On April 25, we counted the votes and declared The Goddard School located in Voorhees, NJ the winner of the 2014 Upcycling Challenge! The competition, part of The Goddard School’s national Root for Earth campaign, encouraged children, faculty and families in Goddard Schools across the country to use their imaginations to create a scene or object using recyclable materials. 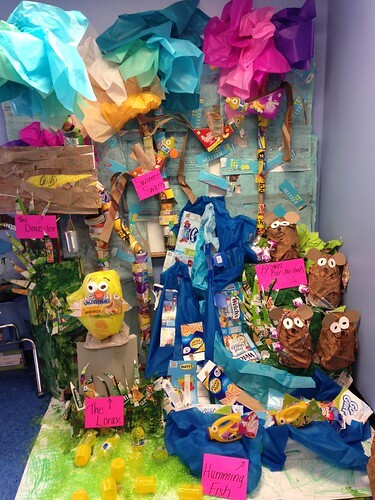 The Goddard School located in Voorhees’s project depicted a scene from Dr. Seuss’s book The Lorax, including “Truffula” trees made from cereal boxes and tissue paper and “Humming-Fish” made from plastic bottles. After reading several of Dr. Seuss’s works during the School’s Dr. Seuss Week in March, the children decided that The Lorax, a fable about the importance of preserving the environment, would make the perfect theme. Once they had their idea, School owner Tracy Sortino emailed the parents to ask them to donate their recyclables. Over the course of three weeks, the parents donated so many recyclables that the School had to recycle the leftovers. Children worked on the project in the School’s pre-k classroom and displayed the finished product there. The children worked so enthusiastically that it only took them a week to finish it. Photos of the completed project were posted to Facebook. The parents were eager to see the School win the competition, and their support helped the School earn a grand total of 675 votes. The School also racked up around 250 shares on Facebook. The competition helped the children learn about preserving the environment as well as the importance of teamwork, Sortino explained. The children also learned about energy conversation during The Goddard School’s national Lights Out! hour, another Root for Earth initiative. Goddard Schools across the nation turned off all non-essential lighting for one hour from 10 to 11 AM on Earth Day. When The Goddard School located in Voorhees was notified on May 2 about its win, the children, teachers and parents were all excited and overjoyed by the news. Most importantly, the School continues to recycle and even recycled the project after it was taken down. The Lorax would be proud.